We like this soup both warm and chilled for warmer weather. Rich beetroots and carrots puree in nourishing chicken broth and create a hearty soup suitable for any time of the year. Serve with coconut flour bread, hazelnut bread, and sliced beef or chicken to round out the meal. Place the beets, carrots, and stock in a crock pot. Cook on high pressure for 25 minutes, or in the slow cooker low 8 hours or high 4 hours, until the beets are soft. Add remaining ingredients and puree with an immersion blender, in a food processor or blender. Add more stock to thin as desired. Serve warm or cool and serve chilled. To serve cold: Chill well and serve topped with yogurt or cultured cream as desired. 12 grams net carbs, this is carby for keto but may fit into some people's carb counts. Previous Post: « What to do about Sun Protection? Love the idea of making cold soups in the slow cooker. Great summer strategy. We’ve been living out of our crock pot this summer. Between the heat and having an 8 week old along with a busy body 3 year my crock has become my new best friend. I’ll be sure to give this a try! BTW, your liver pate recipe in the 30 day GAPS meal plan is to die for. My 3 year old who is very picky requests it as dip for her carrots, cuc’s and snap peas. Oh my! What a change for all of you. Welcome to Arizona! I’m way out in the west valley. And we’re in love with the sunshine! Not sure if I’ll be happy with an endless summer forever, but for now we’re loving it! Hailey, bummer! here is the link: http://www.gilbertfarmersmarket.com/Gilbert_Farmers_Market/Home.html I’ll get in contact with you soon :) yay! The way I look at it, we have summer, fall, and spring in AZ. We just skip winter, which is a-ok with me :-). This sounds wonderful! I may have to try it. Getting bored with my broth/veggies while working towards GAPS intro. I love my crockpot for stock and meats – it’s definitely a heat-saver in the summer (I’m in GA). I’m still eating hot/warm soups since it’s cold in my office. 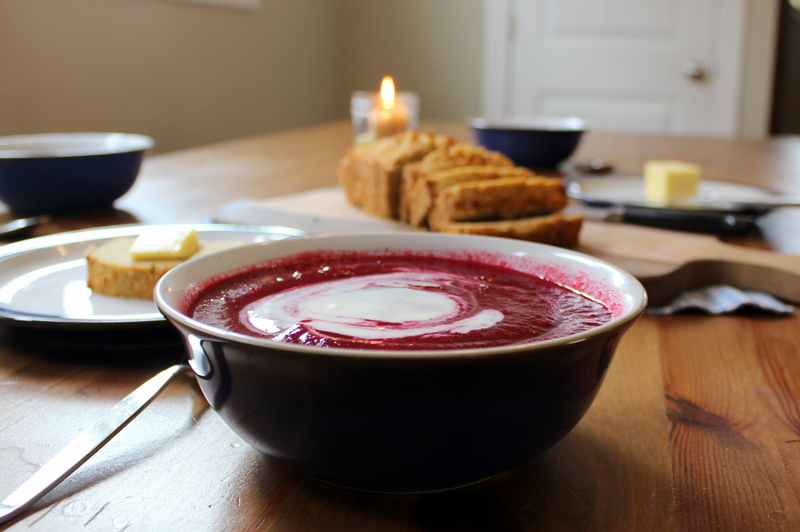 I’m having beets twice today: cooked and pureed with my beef and in borscht. How do you get your crockpots to work outside in the summer? I’ve tried with all three of my cp. They work fine in the house, but outside they won’t cook. Hmm, I haven’t had any problems with ours! I wonder if your outlets outside are tripped or are a different kind? I find that when I use the crock pot outside I need to but a towel over it to keep the wind from cooling it. i am in phoenix…deer valley actually ( 101 and I 17). alot of farmers markets but I like the one back “home” in missoula better. I wanted to thank you for this recipe! I tried making it a couple weeks ago by throwing everything into the crockpot on HIGH and leaving the house for a few hours; turns out I didn’t put in enough liquid and should have had it on LOW. When I got home, there was a sizzling sound coming from the crockpot. There was no liquid left, some of the veggies were burnt, but most of them were amazingly caramelized (I had also added a pat of butter in the morning). So I tasted a beet and then proceeded to eat all of the veggies standing at the counter. They were so good! I’m rather excited about the beet, garlic, and carrot combo, so I’m cooking up some more right now. Maybe someday I’ll even get around to following your recipe to make it into a cold pureed soup, but for now I’m loving it anyway. Thanks! Oh, and welcome to the desert! I’m one state away from you, in New Mexico! I’m going to try this with my pressure cooker. I have the new electric model with programal timer, etc. I love it!!! I make homemade stock in 20mins that would take me a day to make. I’ll let you know how it turns out. So would this be legal soup for Intro stage 1? Thanks this recipe is amazing ! Hello just found your cold beet soup in a slow cooker recipe. Eager to try, saw you’re in west valley. I am in Verrado. Some add ons at the end that my mother used to put into cold beet borscht soup were diced cucumber and chopped green onion (or chives).